Even Hurricane Harvey couldn’t stop Antone’s Famous Po’ Boys from marking the 55th anniversary of the original Antone’s Import Company opening in Houston. As planned, this week diners can snag some major bargains on po’ boys and more. There really couldn’t be a better time to offer Houstonians a dining deal. New, though, is a charitable aspect to the promotion to help victims of the recent storm: 20-percent of sales this week also gets donated to the Houston Food Bank. 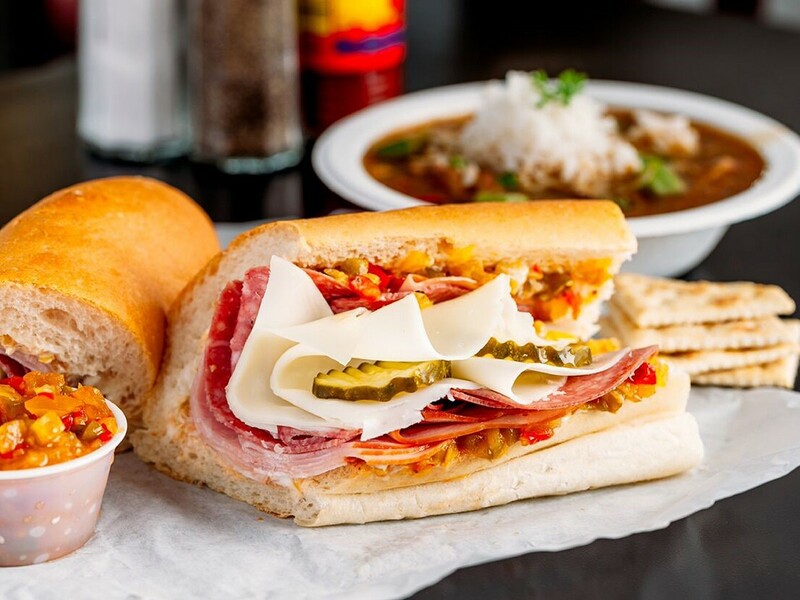 The specials are available at the Antone’s Famous Po’ Boys stores at 4520 San Felipe and 2724 West TC Jester, as well as kiosk locations at 3 Greenway Plaza and the downtown tunnel at 811 Louisiana. Other Antone’s po’ boy styles are also on sale with a limit of four per customer. The Super Original (same toppings as the Original, but with extra meat and cheese), Turkey (with oven-roasted turkey, Swiss cheese, mayonnaise, and bread-and-butter pickles) and Tuna (with housemade tuna salad, provolone and pickles)—will be $1.55. That’s $5.40 less than usual. 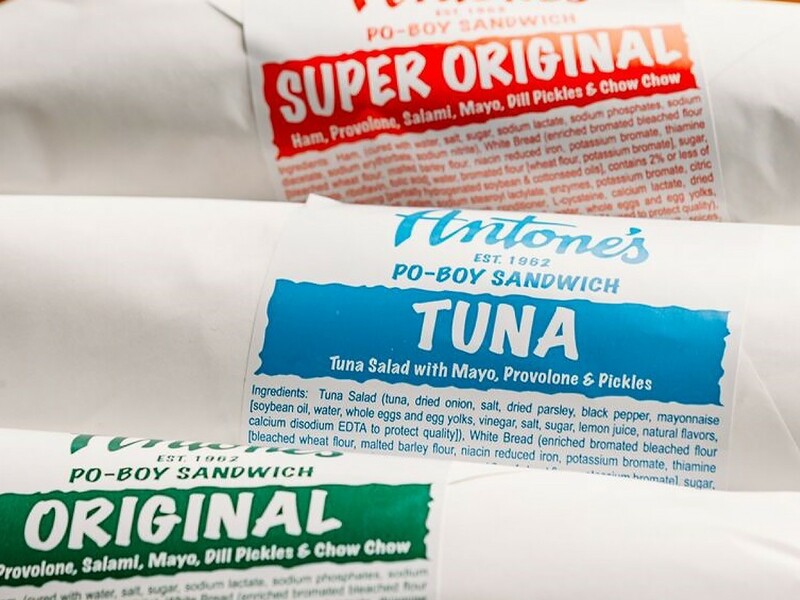 Since the anniversary specials were first announced in August, it’s been an interesting time for Antone’s Famous Po’ Boys chief executive officer Jonathan Horowitz. When Hurricane Harvey hit and the flooding started, he mobilized his staff to help. “As soon as we could access the commissary location—which I believe was on Tuesday, following all the crazy rain—we were able to get in two employees to make sure everything was safe. Then, we put out a call for volunteers, some of whom were our own families.” By the time all available ingredients had been used, the group had made 11,000 sandwiches. Horowitz delivered many personally. The sandwiches were donated to hospitals, police stations, shelters and first responders. 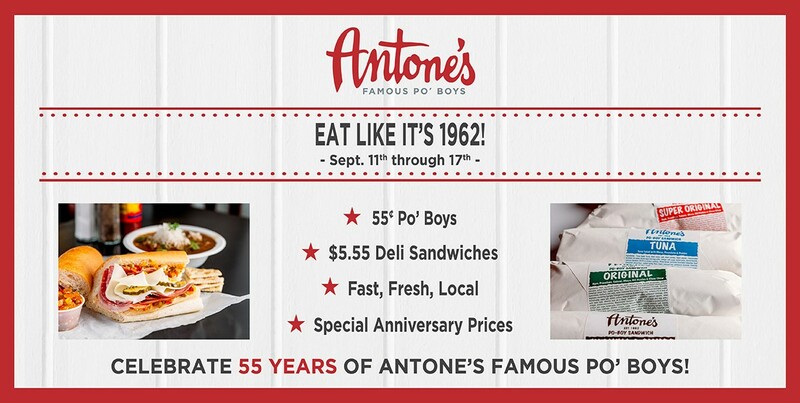 In addition, all of Antone’s deli and hot sandwiches will be $5.55 during the anniversary week, the only exceptions being the fried po’ boys. Antone’s is also giving diners a gift to-go. Any customer who visits during the promotional hours of 1 to 3 p.m. also gets a 19.62-percent-off coupon that’s good through December 31. (1962 is the year that the first Antone’s Import Co. opened.) The coupon is good for dine-in or to-go orders, not catering or delivery. The original Antone’s Import Company was a combination sandwich counter and grocery store. (It was fast-casual before it was cool, y’all.) The son of Syrian immigrants who was raised in Port Arthur, Antone started serving New Orleans-style po’ boy sandwiches as a way to get people in the door who had no familiarity with traditional Middle Eastern dishes. The sandwiches’ popularity helped him maintain Antoine’s Import Company as a source of spices, dry goods and other ingredients common to his family’s native cuisine. After 40 years in business, Antone’s Import Company closed in 2004. To this day, Antone’s Famous Po’ Boys uses the same freshly baked bread from Royal Bakery in Montrose for its popular sandwiches. The company also sources certain specialty breads from Slow Dough. Here’s the list of locations. For more information, visit the Antone’s Famous Po’ Boys website. Disclosure: Antone’s Famous Po’ Boys is a Houston Food Finder sponsor. We would have let readers know about this great deal anyway, though. Fond memories.Thank you for all you do for our communities. I’m from 4th Ward in Houston, Texas and as a child born in 1962 we visited the Taft st. location near Allen Pkwy. Those sandwiches were the best. The finest po-boys around! !